Wendy Davis, the woman whose 11-hour filibuster focused national attention on Texas’ efforts to restrict abortion access in 2013, celebrated Monday when the Supreme Court ruled that the state law was unconstitutional. In a 5-3 decision Monday, the Supreme Court struck down two abortion restrictions in a Texas law, known as HB 2, that would have shut down dozens of clinics across the state. It mandated that abortions take place in ambulatory surgical centers, or mini hospitals, instead of regular clinics. 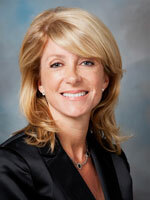 On June 25, 2013, Davis, then a state senator, took to the floor of the Texas Senate to protest the legislation. Davis’ filibuster successfully helped Democrats delay passage of the bill, although the Senate later passed it in another session. Since HB 2 went into effect, the number of abortion clinics in Texas has dropped from 42 to 19. Davis said Monday she expects it will take several months for access to rebound. “But I know there are many people and organizations that are committed to making sure that that health care is returned, and that women have their reproductive freedoms restored in Texas,” she said on MSNBC. The title of this post is taken from a Dan Patrick sour grapes quote, and I can just imagine some of the things he’s been saying out of reporters’ earshot. Stings a little when you get slapped like that, doesn’t it, Dan? The point here is to remember that Wendy Davis was right. She was right that HB2 was a sham that would hurt women, she was right to get on the record all of the inconvenient fact-based medical questions that the Republicans refused to answer but the Supreme Court one day would, and she was right to stand and fight even though the votes were against her and she couldn’t later capitalize on that energy in the next election. The fight itself mattered, and even with the cost that came with it the vindication that Monday’s ruling brought was well earned and deserved. Whatever else happened since that day, Wendy Davis was right. We shouldn’t ever forget that.